TrendForce's Green Energy Division LEDinside estimates that the global demand for LED bulb and LED tube will increase by 86% and 89% in 2014 respectively over 2013. Terri Wang, an analyst of LEDinside, points out that the rapid decline in LED lighting product prices are stimulating the market demand, hence manufacturers have continued to introduce various LED lighting products with the prices close to that of traditional lighting products. 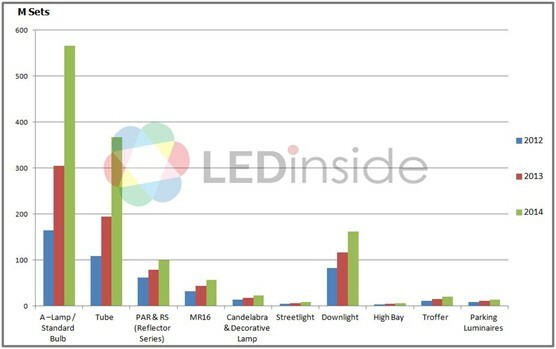 Taking LED bulb as an example, comparing with 2012, the drop in LED bulb price in 2013 becomes more obvious, and the product price gap between different brands is gradually narrowed. Besides, the positive price strategies of first-tire manufacturers are expected to promote the development of LED lighting market greatly, and the demand driven by price incentive will be further fermented in 2014. In addition to manufacturers' pricing strategy, the projects and subsidy policies in regional markets also have made significant contribution to the improvement of LED lighting penetration. For instance, EnergyStar subsidy program is still carried out in various areas of North America, and the prices of subsidized lamps are more acceptable for consumers. In addition, national policies to forbid incandescent lamps have been implemented successively, which play great role in promoting LED lighting market development. For the channels, since the regional characteristics of the lighting is fairly obvious, nations' regulations and consumer habits are different, which also indirectly affect the sales channels. After LED lighting has become flourishing, more and more LED manufacturers started entering the lighting market to compete with the traditional lighting manufacturers. They grab dealers or directly occupied large retail stores, making lighting manufacturers pay more attention to channel management. Thus, in the fast-growing LED lighting market, lighting manufacturers are integrating resources and enhancing competitiveness by acquiring channels and technologies. Currently lighting manufacturers mostly adopt various wireless transmission technologies and overall intelligent control technology, or even adopt green building solutions with a variety of renewable energy. Consequently, there will be enormous business opportunities in the future. In addition, brand image promotion can make premium easier for lighting manufacturers, and can also extricate them from the predicament of continuing price competition. LEDinside analyst Terri Wang indicates that in 2013 and 2014, lighting manufacturers' main development strategies include lowering product prices, actively seeking projects and subsidies, building sales channels, enhancing competitiveness by acquiring channels and technologies, promoting intelligent lighting, and improving brand image.